The Dallas Cowboys player charged with intoxication manslaughter was going at least 110 mph at the time of the deadly crash that killed his teammate and close friend, according to police documents obtained by NBC 5. 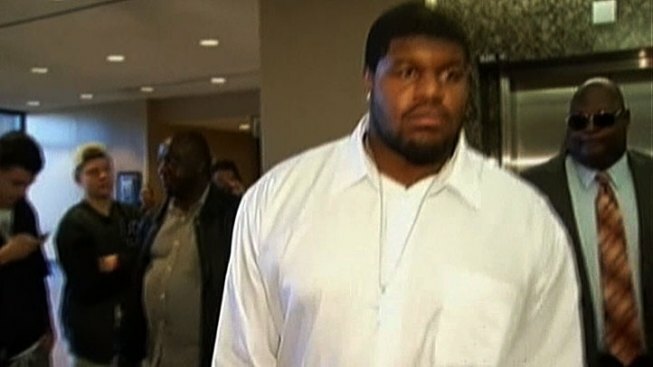 Police have said that defensive lineman Josh Brent's blood-alcohol content level was more than twice the legal limit. Cowboys practice-squad member Jerry Brown Jr. was killed in the Dec. 7 crash along state Highway 114 in Irving. Police documents detailing the crash and a timeline of what happened that night are now in the district attorney's office. According to the documents, Brent was going at a minimum of 110 mph down Highway 114. The report said he may have gone as fast as 134 mph at points. At least three different surveillance cameras at a nearby Dallas Area Rapid Transit station captured the car, according to the documents. Investigators said the cameras recorded Brent going through a green light at Tom Braniff Drive. Two 911 calls were made from the car. In one, clicking sounds from the car's flashers are all that can be heard. 11:15 p.m.: Brent and some teammates were at Eddie V’s in the Oak Lawn section of Dallas. 1 a.m.: According to witnesses, Brent was at Beamers Nightclub. 2:15 a.m.: Surveillance cameras from the club show Brent driving away. 2:19 a.m.: DART cameras capture Brent's car driving down Highway 114. 2:19 a.m.: A 911 call was made automatically from the in-car phone. 2:21 a.m.: The first passer-by calls 911. Police determined that neither Brown nor Brent had on seatbelts that night. Brent told police the car's steering wheel was a "little shaky," but police found nothing wrong with the car. Investigators determined that the car flipped over because Brent was driving faster than 100 mph, causing him to lose control after hitting the curb. At the earliest, the case could go to trial this summer, Brent's attorney said. The defense team is waiting on pieces of evidence on the case, including surveillance videos from the different cameras involved. Irving police did not return calls for comment Tuesday.